Aspire 26650 - bigger battery, bigger power, great capacity. 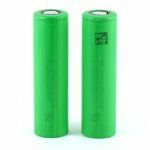 The Aspire 26650 4300 mAh high drain lithium ion battery is a solid choice for folks looking for a high capacity 26650 sized battery. 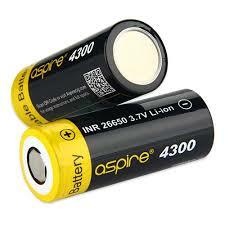 This is the updated version of the Aspire 4200mAh battery.Tested and Rated for Both Pulse AND Continuous Loads. The Aspire 26650 has different ratings for continuous and pulse amps. And unlike some manufacturers, Aspire has done a great job being very specific about what those pulse loads mean (10s on, 5s off), which Aspire calls a "vaping simulation". This is great information for all folks considering this battery, since it demonstrates what this battery can really handle without heating up. Li-ion Batteries may explode if you do not charge or discharge them properly. Please note that due to their inherent safety, IMR cells don’t have a protection circuit built in. They should never be discharged below 2.5 volts or cycle life/performance will be reduced. Maximum charge voltage is 4.25 volts. DO NOT STACK BATTERIES. DO NOT INSTALL BATTERIES WITH ANY FORCE. If casing is cut, discard battery. 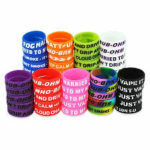 This Type of Product is Designed for Veteran Vapers Only! We Are NOT Responsible for ANY Misuse of Devices. Including Batteries, Atomizers, and MODs.